Many times you may have faced the problem of app asking for a mandatory update to run. But you may not wish to update the app thinking to lose some of the app experience or features. The apps like WhatsApp, Netflix, Hike, WeChat, COC etc ask for a force update to run. This basically happens because the app makes some changes which have an effect on all. For example, if WhatsApp has an update for some emoji smiles, then the one who hasn’t updated the app will not be shown the emojis. Thus causing communication problem, this is why some apps ask you to make mandatory updates. You can skip this updates and use older versions of Android Apps without any compulsion just using a simple trick which actually is a form of a setting change. No root permissions are required. Note – You can try APKMirror.com to download an older version of the App on your device but after installation, if the App forces you to update to the latest version from Play Store than go for the method below. Step 1: Download and install the older version of the App on your Device. Step 2: Download APK Editor app from Google Play Store. Step 3: Open Google Play Store and search for the app. Click on Read more and scroll down to check App version. Step 4: Now open APK Editor App and click on ”Select APK from APP”. Step 5: Now look for the app and click on “common edit”. Step 6: Here change the Version name with the latest one you noticed in Google Play Store. Step 7: Apply the changes in APK Editor App. Step 8: Uninstall the pre-installed App and install the modified App from APK Editor. Holla! You have just nailed it. What if the App Version says “Varies with the device”? First, download the latest version of your preferred App. Go to Android Settings and look for the option Apps/App Manager. Check for the App, open it and look for App version. Note the App version and proceed forward with the steps above. Once done you can use an older version of the App on your Android Smartphone without any update and enjoy the App experience and features. I have also provided a video demo of the same. Conclusion: With the method above you can download and install an older version of the App on Android without force updates. The method may not work on all the Apps which need real-time internet access but still, you can give it a try. I hope the post was helpful. Do comment below for any of the assistance or queries. Have a nice day Cheers! 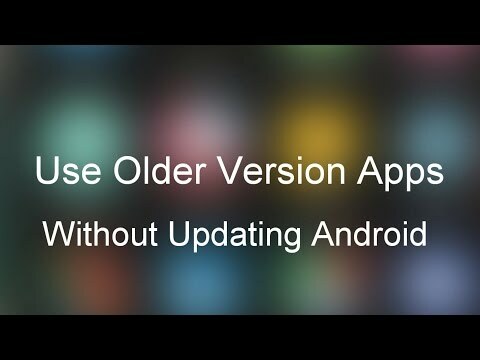 If you've any thoughts on Use Older Versions of Android Apps Without Updating, then feel free to drop in below comment box. First unistall the old app and install the modified app. Does it always take longer then a hour to write? Which app are you trying in? I’ve done that every time. after editing whatsapp apk says incorrect date and time. I’m having the same issue – it says it’s the latest version however when I open the app it says it needs to be updated, once taken to the Play Store you are unable to update the app. I keep getting a failed install error even after deleting the original file…any ideas? Cannot work with wechat.. any advice..? It doesn’t work on Choices: Story of Your Life. Can you help ? But my system says “update now” message..
everything done but again asking for update your app, I am using this on golf clash but not done pls help. Not working with Wechat… It says” please update the app n try logging in again”! It is not working on criminal case moded apk…!!! When i try this and uninstall an install but stil coc says new update available…. why??? I did exactly as you recommended installing an older version of wechat (5.3.1.100). Updated version from old to latest using APK Editor. Deleted the installed version and then reinstalled using the modified version in APK Editor. Launch modified version of wechat and same message ‘ ver of wechat out of date … update to latest’. How do I get around this issue? Not working for coc ? I did the same step aa u told. But still it is asking for update. I am asking u regarding jiotv app current jiotv app is not working on Chromecast aa older version works superb. I wanted to run jio tv app on my led tv with Chromecast. modified whatsapp (veersion 2.17.926)apk also show force updation message… after change the version to new one…..
Hello I am just amzed from your idea Hope that it will continue, nut i tried it from my app last day on earth still looking for an update and when I go to playstore it says open ? For Which App are you trying for? For which app are you facing issues for? I go through the above process, When I open coc it shows update the latest version and it takes to play store and there there is no update just uninstall and open is there. Not working for my jio app version 3.2.43. Plx tell me how can i use my jio app version 3.2.43 without update pop ups. I get a return of null exception pointer when trying to save the editted app, what can I do? Any idea if this will work for an older version of Hangouts? I want to prevent the “you must update” nagging screen that prevents you from using an older version of hangouts. I tried the steps you gave, but when trying to open the new/modified Hangouts it force-closes every time. I think it’s the fact that the signature key is being changed. Any work around to this? for angry birds match not working which i have followed the exact steps..
Not working for Modern Combat 5: Blackout. Please help!!! Not working for unkilled. Cant change ver number and version code. Tried to change obb data too. I tried it with a few games and it works. It also didn’t work for some. I m guessing that if it is a major update that is required, then this trick won’t work. I also figured that some updates were to prevent cheating so the file structure (format?) may change, so again this method won’t work for that. Thanks dude, you have showed me a very cool trick especially for modded games. sir I tried with DBS app but the still update notifications is coming up again and showing that you have tampered the app. why? help me I want to use old version of DBS digibank ver. 1.7.4 because of some good options in it. Banking Apps run on real-time data. So, it would be not possible. What if he says: current version too low please update. Is there a way to boost the old version? Thanks so much…i love it! cannot bypass the “this version has expired” popup – how can that be removed?